Da-da's actually quite sweet -- provided you apes take Hill 407 this time without tantrums. 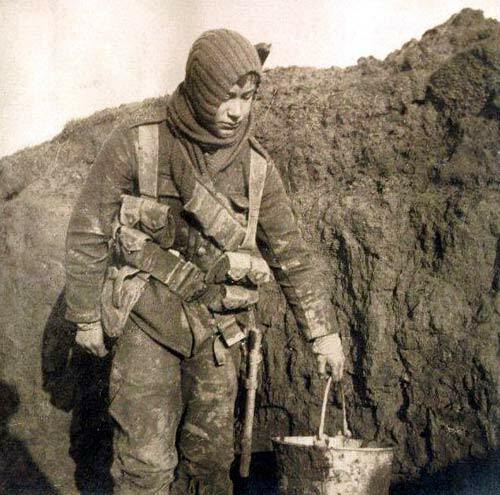 After inspecting his sleeping troops and settling in to his cold k-ration beany weenies -- AGAIN -- after a terrible day in the kid-trenches (trench beany weenies are the highlight), Da-da ruminated on what it's really like to be A Man Called Da-da, with two sub-7YO mental patients -- or being a parent, in general. What's it really like? Do you feel exhausted from little or no sleep/being up all night, your fatigue the stuff of legend? Are you perpetually rumpled, dirty, unclean, unshaven, unkempt, perhaps even STINKY -- in public -- and find that you simply don't care? Have you started to resemble Chewbacca? Make Wookie noises? Do you often find yourself wearing the same clothes over and over, day after day? Do you find yourself scarfing cold or lukewarm, greasy food while standing up/walking/running? Have you found that you actually not only LIKE beany weenies, but talk about it in public? Do you occasionally find yourself screaming? Do you occasionally find yourself screaming the same thing over and over? And over? Do you occasionally scream or pontificate about beany weenies? Has your memory... um, is the... what was the question? If you answered YES to many of the above questions, CONGRATULATIONS: you're a parent. Or perhaps a teenager. dude. i am exhausted after taking your questionaire. i do not know how you do it. with you for another 10 years, right? Some people say there are Atheists in fox holes. I don't think that's true. But I do know there are no clean underwear there.